Great Family Home! Close to Downtown Morro Bay! The perfect family getaway home is located at 540 Downing St in Morro Bay. This single level, 4 bedroom, 2 bathroom home, is the perfect home away from home for your next trip. 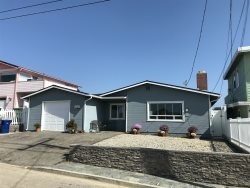 Step into this beach themed vacation retreat and you will find a spacious living room with a large flat screen TV and views of Morro Rock out your front window. Off the living room is a classic kitchen with breakfast table perfect for creating that memorable meal in and full stocked with all the cooking utensils required. Off the Kitchen is another large family/dining room with a large table and flat screen TV. This room opens to a fully fence and wind protected patio perfect for BBQ’in or relaxing on a Sunny afternoon. The home also provides sleeping accommodations for the entire family. The first bedroom has two twin beds, while the second and third bedroom each have queen beds. The Master Suite is a perfect getaway feature a queen bed and private bathroom. This home is perfect for a large or small family, or a friends or couples get away! Book this beautiful beach retreat today!